The genetic diversity of muscle diseases is extensive, and new tools are required to investigate the mechanisms of disease and test new therapeutic interventions. Cells isolated from patients serve as a source for specific models that allow for the study of disease in the context of the patient’s own genetic landscape, and these cellular models are taking on increasing importance. Developing patient-specific cell models relies on having an easily obtained source of cells, and if the cells are not derived from the tissue-type of interest, a robust reprogramming process is needed. Muscle biopsies are invasive, and at times problematic for patients with muscle-mass limiting conditions. Alternatively, cells requiring less invasive methods of isolation are easier to obtain and readily available for research. Commonly used human cells for research include blood cells or dermal fibroblasts derived from skin biopsies. While considerably less invasive than muscle biopsy, there is an associated stress with collection of blood and particularly skin, especially from pediatric populations. Urine is a non-invasive and easily obtained source of patient-specific cells. The isolation of cells from urine was originally described in the late 1970s, although it never gained widespread use as a source for generating primary human cultures. More recent studies have revitalized interest in urine-derived cells (UDCs), and with improved isolation techniques, UDCs are readily cultured from individuals of all age ranges. Typically, a UDC culture can be established within 2-3 weeks from collection. UDCs demonstrate a high proliferation capacity as well as an inherent plasticity for reprogramming. In addition, the acquisition of urine is non-invasive, minimizing any stress associated with sample collection, a desired attribute when sampling pediatric populations. 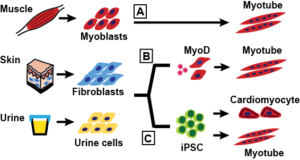 Strategies to generate cell based muscle models – these include A) tissue biopsy of muscle and differentiation of cultured myoblasts, or the reprogramming alternative cell types through B) direct or C) indirect methods, followed by differentiation into the myogenic lineage. With indirect reprogramming, primary cells are first de-differentiated into induced pluripotent stem cells (iPSCs), which are then differentiated into multiple cell types dependent upon tissue-specific culture conditions. iPSCs can be readily differentiated into cardiomyocyte or neuronal like lineages, although the differentiated cultures are typically mixed cell populations. In contrast, direct reprogramming eliminates the stem cell phase and instead involves the induction or overexpression of tissue-specific ‘master-regulator’ genes to directly drive a primary cultured cell into the desired lineage. More than three decades ago, direct myogenic reprogramming of fibroblasts with MyoD was a central experiment used to demonstrate the role of transcription factors, as MyoD controls temporal expression of early and late genes in muscle development through a feed-forward mechanism. Indirect reprogramming of iPSCs into skeletal muscle has been more challenging, and the comparative ease of generating cardiomyocytes from iPSCs has led to this cell type being used as a surrogate for skeletal muscle. Recent progress in generating skeletal muscle cultures from iPSC is encouraging, although variable outcomes within and across culture systems still need to be addressed. In a new report published in the journal Skeletal Muscle, we detail a straight forward method to directly reprogram UDCs into the myogenic lineage with induced MyoD overexpression. We found a robust pulse of MyoD expression drove the cells into a mature muscle-like phenotype, complete with organized sarcomeres and spontaneously twitching myotubes. When applied to UDCs from muscular dystrophy patients, this method generated mature myogenic cultures that reflected the primary disease phenotypes. This method details a simple strategy to generate an in-vitro model of skeletal muscle from almost any human subject. Myotubes generated from iMyoD reprogrammed urine-derived cells (UDCs) – Images of iMyoD-induced UDCs after 35 days of differentiation. Markers of muscle maturation include the expression of dystrophin (green) and fast myosin heavy chain (MHC) (red). White arrows highlight the membrane localization of dystrophin. White arrowheads highlight the formation of sarcomeres. coglycan. The availability of multiple patient cell models allows us test common therapies for different mutations of the same SGCG gene, while also developing specialized treatments for patient-specific SGCG mutations. In the Skeletal Muscle report, we also describe the amenability of urine-derived cells to gene editing with CRISPR/Cas9 technology. The use of this new and powerful system to correct mutations that cause Duchenne Muscular Dystrophy has provided proof of concept for the potential of gene correction of disease causing mutations. Alternatively, CRISPR/Cas9 mediated gene editing can insert mutations into a control cell line, creating a ‘disease in a dish’ model, allowing for the study of disease without direct access to patients. For example, using this approach a series of dystrophin gene mutations could be generated in order to test exon skipping for multiple different mutations in the same genetic background. The relative ease of urine cell isolation coupled with the ability to generate gene edited single cell clones, make this an attractive platform for CRISPR/Cas9 technology. The number of genomic mutations implicated in the cause or exacerbation of human disease is steadily increasing. As the scope of our knowledge expands, new tools are required to investigate the mechanisms of disease and evaluate new therapeutic interventions. A readily available, non-invasive source of cells from which to generate tissue-specific models muscle-like cells is highly useful, especially for the development of patient specific treatment regimens, a key component of the movement towards precision medicine. Eugene Wyatt is a postdoctoral researcher in the Center for Genetic Medicine at Northwestern University.His focus is on the development of human models of muscle and heart disease to test new therapies, including gene correction and gene editing. Ellis Kim is a graduate student at the University of Chicago. She studies disease mechanisms in muscular dystrophies using cell models.